The island of Inishturkbeg is in receivership, which just covers the hospitality business. The brand business, of which whiskey is the principal part, has always been run independently and is not in receivership. 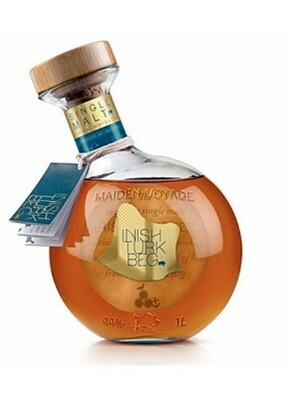 Plans continue for the development of whiskey, branded Inish Turk Beg (and Eternal Voyage is the follow up to Maiden Voyage as a product) and other iterations from Clew Bay, more generally. The Sunday Times last weekend reported that receivers have been appointed to the company that owns Inish Turk Beg, an island off the west of Ireland. For the moment, it's business as usual but the receivers will want to generate cash for the creditors that appointed them so it's likely that the island will go on the block in the near future. The entrepreneur who owned the island, Nadim Sadek, an Irish-Egyptian, spawned all sorts of ventures from his Inish Turk Beg base. The one that interests us here is whiskey. With the attractive presentation and the various unique touches it should fly off the shelves. Maybe it does, for all I know, but I suspect the price gives buyers pause: €155 in Ireland. That's a lot for 10-year old Cooley malt. It's a lot for any Irish whiskey. While it's nice (though a little softer than I anticipated) it's more than I could spend on a whiskey for drinking. As I write, for example, I'm enjoying a Grand Crew 9yo Cooley malt that I absolutely love but only cost me €60. A 10-year old port finish Tyrconnell would set me back the same. I hope this isn't the end of the story for Inish Turk Beg whiskey. I imagine that Nadim Sadek is the kind of guy who wouldn't have been happy until he had his own distillery on the island. I wish him luck in whatever he does next. I hope it involves whiskey.